For several years now, I’ve done my best to keep up with a few books a month. From business and etiquette to ridiculous fiction and biographies, I’ve been trying to keep in line with reading at least two books a month. Between recommendations from my book-loving friends (I’m looking at you, CD), the main displays at Carmichael’s on Frankfort Avenue, and the consistent pop-ups on Goodreads, I’ve been finding more and more new reads. The first three months of this year was interesting…. Becoming by Michelle Obama: I started 2019 reading Mrs. Obama’s memoir. Regardless of where one stands politically, it has to be admitted that her life’s journey has been nothing short of impressive. From humble beginnings on the South Side of Chicago, making her way through colleges she may not have belonged in and career opportunities she wasn’t expecting, I’m sure that becoming the First Lady of the United States was far from what she thought she’d become. Her recounting of election night 2008 was interesting- she was still in disbelief even then. Her relationship with her husband has always seemed to be a light-hearted and respectful one, and their marriage as seen through her eyes is sweet. Now living post-White House in DC, the time she’s had to reflect on her life has resulted in a beautifully written way. 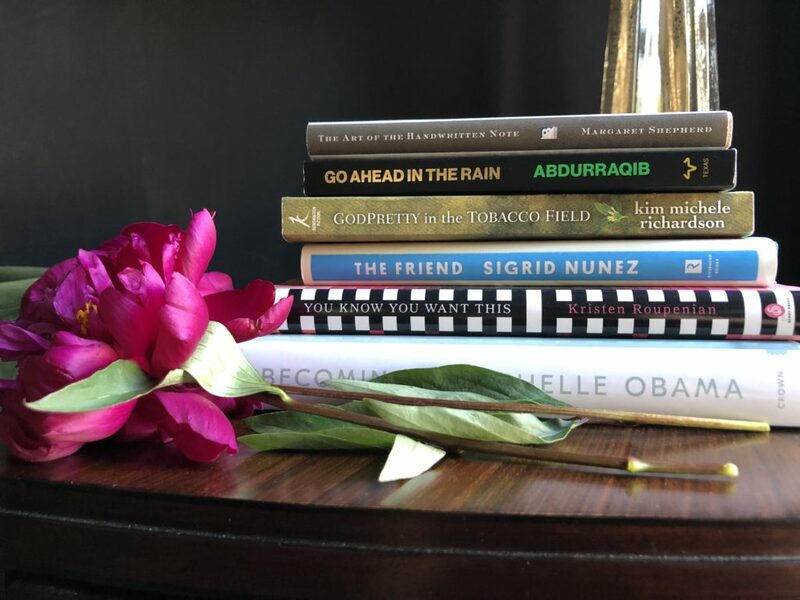 The Friend by Sigrid Nunez: This was not an easy read. Left to take care of her ex-lover’s giant and very neurotic Great Dane after his unexpected death, our protagonist faces the challenges of dog ownership at a time when she feels she should be grieving and facing her depression. Our main character is a writer by trade, and the verbiage and descriptors used seem a little high-brow, and- at times- cloud what should be a clearly-seen picture of the goings on. Undeniable here is the love one finds in a four-legged friend, and the heartbreak that comes after any loss. The Art of the Handwritten Note: A Guide to Reclaiming Civilized Communication by Margaret Shepherd: If you know me, you know I’m a note-writing fiend. On overage, I send 30 notes a month to friends, clients, neighbors, and business associates, and I believe there’s no better way to apologize, to express appreciation, to bring a little light, or say hello than with a note. This sweet little book serves as a guide for anyone no matter their relationship with pen and paper. With recommendations on bettering your penmanship, suggestions on what type of pen to use with what quality of cardstock, and suggestions on how to say something as simple as “thank you,” this one is a must-have for anyone who communicates via paper. Go Ahead in the Rain: Notes to A Tribe Called Quest by Hanif Abdurraqib: Oh, man… There isn’t enough good I can say about this one. Following the rise to fame of A Tribe Called Quest and their decades-long career in music, writer Hanif Abdurraqib weaves a love story to early hip-hop and manages to inspire you to listed to Midnight Marauders and The Low End Theory on repeat. If you love music, and/or if Q-Tip’s funky rhymes make you groove, just read it. You Know You Want This by Kristen Roupenian: A collection of dark and hilarious short stories. A quick read, if- like me- you have the ability to zoom through a shorter narrative. One was an updated version of the spider-laid-eggs-in-someone’s-face tale that left me a little creepy-crawly all over for hours afterwards. GodPretty in the Tobacco Field by Kim Michele Richardson: Familiar, due to my upbringing in a tobacco field in a small Kentucky town, this novel is set in 1960’s Nameless, Kentucky, where a teenage girl is raised under the protective hand of her much older uncle. A relationship with the African-American farmhand has started to bloom into more, and while our heroine searches for ways to get out of Nameless and away from her uncle’s religious rule and her poverty- and jealousy-striken neighbors, love stories of the past unfold. It’s a sweet narrative, but one that ended too abruptly for my liking, leaving a few questions. Still, for anyone who knows what it feels like to pull tobacco worms off of sun-warmed leaves, this one will feel comfortable.